A series of fantasy Russian 100 Ruble banknotes have recently been produced featuring Russian cinematic themes and actors. 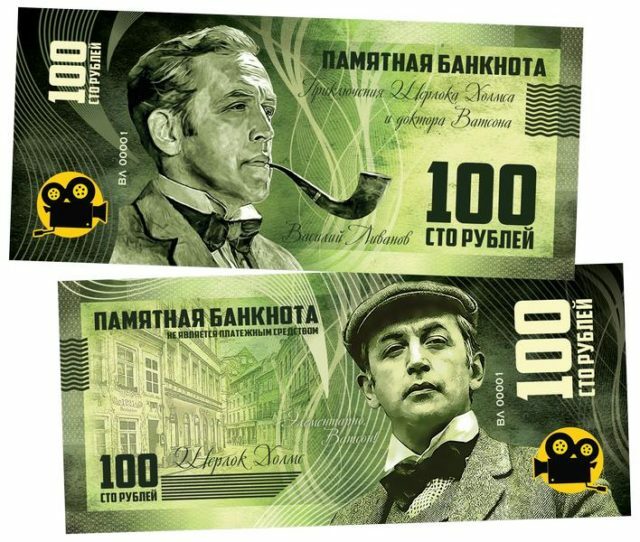 One of these banknotes feature Vasily Livanov, who portrayed Sherlock Holmes in the 11 episodes of the 1979 – 1986 Soviet television productions of The Adventures of Sherlock Holmes and Dr. Watson. These notes are made of polymer and appear to be very well done. This post is being written before we have had the opportunity to examine one of the banknotes and will be updated as we get more information. Specimens can be purchased at reasonable prices on a major online auction service. Search for any combination of “Sherlock Holmes,” “Russia” and “100 rubles” to expedite your search.